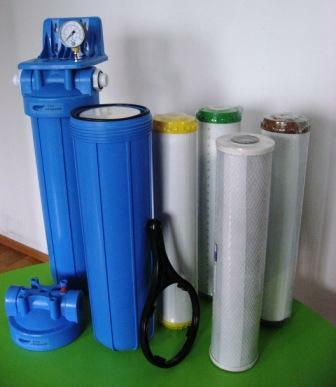 The drinking water filter BIG BLUE 20 " selection criteria, installation and operating conditions. 20 " Big Blue cartridge with plastic housing is well suited for cleaning drinking and production water for apartments, private and summer houses with medium consumption (up to 10 m3 / month). Another area of use is mechanical filtering of technological water, for example, before reverse osmosis device. Depending on the purpose of use the BB-filters can be used alone as well as in series or in parallel connection. Filters are connected with horizontal piping to a vertical position, preferably between valves. One can also add a by-pass valve and manometers for pressure control. Connecting with the water pipe with 3/4 " or 1 " internal thread. Suitable cartridge (length x diameter) 20 x 4½"
Installation of the filter must be carried out with the assumption that the rigid connection with the metal pipes don't leave mechanical strains to the screw connections, which can lead to cracks in the plastic housing. Threaded bendy hoses with wire mesh suit well for connecting plastic filters. Filters are fastened to the wall by brackets in a vertical position. It has to have enough space from the floor, that you have room to unscrew the casing and change the cartridge element. To simplify the element change, suitable valves are are installed in the input and output. Filters can be connected in parallel to increase productivity. Filters can be connected in series for many different actions to take place at the same time. To monitor the loss of pressure(up to 0.5 bar) it's recommended to install manometers to know when to change the cartridge element in the right time. To keep the water quality good at all times, the filters need to be changed on time. The elements usage limits depend directly on the quality of raw water and the amount of use. Crossing the suggested usage limit can cause a decline in quality or pressure loss in the water way. The work time indicated in the table above is an average value, so the water quality should be monitored and analysed in the first year, in order to identify the optimal usage limit for the filter element. PP, PS, EL - the criteria for the mechanical cartridge is the increase in pressure loss after it been filled with sediment and it causes water pressure drop in the consumption water pipes. If the pressure loss increases to 0.5 bars before 12 months, the cartridge should be washed(EL-cartridge) or changed. After using for a year the mechanical cartridge should be changed for hygienic purposes, whether the pressure loss happens or not, because microbes may start developing in the accumulated sediment. B - Active carbon cartridge has to be changed after it's best before date because active carbon is an absorbent, that absorbs all the harmful impurities that are found in water. Because there is no pressure loss or visually observable changes, active carbon's status can only be discovered with chemical analyses, that is difficult to carry out by regular users. To avoid the risk, it's easier to change the cartridge on time. ST, FE - Water hardness and iron content are both easy to track with the express tests. To change the cartridge, close the valves in the filters input and output. Then release the filter from water pressure by pressing the red button on top of the housing. With the filter key turn the housing open and change the cartridge. Make sure that the new protection film free cartridge is the right way, gasket side up and according to arrows on the housing. PS- and EL- mechanical cartridges have identical ends and go in both ways. Close the housing by turning the cartridge by hand, WITHOUT USING THE KEY. If you do it the right way the cartridge turns in the thread easily without hindrances until contacting the stopper. Ensure that housing seal is exactly in the right position in its groove. Open the shut-off valves and make sure there is no leak. If it drips then tighten the housing additionally, if necessary, with a key. Press and hold the red spring valve until all the air is out of the filter and only water comes out. Release the spring valve and the filter is working again. If you are interested in a Big Blue cartridge quotation, please fill in the form below and send us a message.